Yesterday the temperature was in the low 30s with 50mph wind gusts...what a perfect night for soup! Jon suggested that I make my corn chowder, a recipe I developed myself. It has a bit of a southwestern kick with the peppers, spices, and jalapeno cream. So what to pair with it? I had some chicken so I decided to make some chicken soft tacos with a creamy pepper sauce. 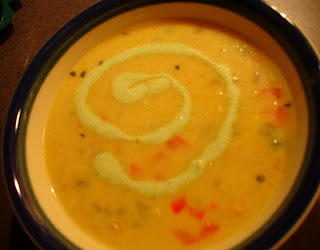 I first made this corn chowder for my dad's birthday a few months ago. I didn't mix crab in this time, but I did make the jalapeno cream. Here are the recipes for both the soup and the jalapeno cream. 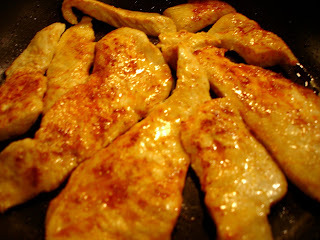 For the tacos, I took thin sliced boneless breasts of chicken, covered them in chili powder, cumin, cayenne, and onion powder before cooking them. 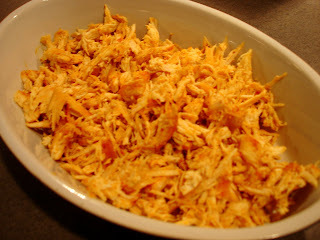 Once cooked, I shredded the chicken with 2 forks. I then made a creamy pepper sauce. I sauteed chopped red and green peppers in just a touch of olive oil. I then added about 1/3 of a block of cream cheese and let it melt in the pan. I added just a pinch of shredded cheddar. When assembling our tacos, I put a layer of the sauce directly onto the tortilla and topped it with the chicken, some cheese, and some of the Jalapeno cream. Jon put the sauce on top of his chicken, along with some cheese and jalapeno cream. 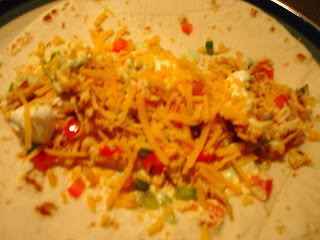 The sauce kept everything creamy and the jalapeno cream was the perfect flavor addition to these tacos!